This time I will look at ways in which to find the centre of a bowl blank. When I run a course, many people ask me which is the best way to find the centre of a bowl blank. The answer is that there are lots of ways. Is it just woodturners who can't give a definitive answer to a question? I will tell you a few ways that I use to find the centres of bowl blanks; this can depend on the bowl blank size. The ways will range from jigs to a type of calliper; some are homemade while others can be bought from your local woodturning suppliers. However, I am sure there are lots of other ways to find the centre of bowl blanks which I don't use or have not thought of. To use this type you need to rest this jig on the surface of the bowl blank which is going to be the top of the bowl. 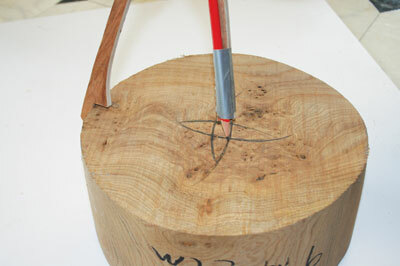 Next, draw a line with a pencil which has a sharp point, then rotate the jig 90° and draw a second line. Next, rotate again and do this until you have four lines. This will give you the centre where all the lines meet. This will work up to a 200mm blank. of a centre punch. To use, place on the blank, centre the disc on the blank and centre punch through the hole in the centre. This type can be bought or homemade comprising a piece of acrylic sheet 485mm in diameter with circles drawn on. The circles increase in 25mm diameters, with a hole in the centre. Mine has coloured lines to help identify each circle. 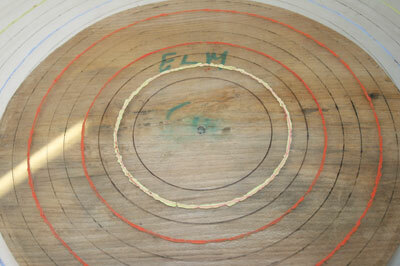 To use place on the bowl blank and move until you find the circle which matches the bowl blank diameter. 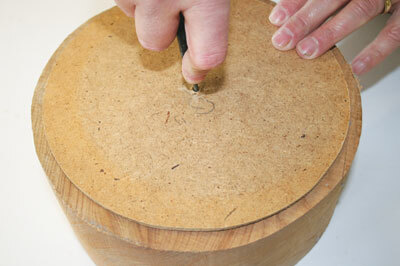 Now use a punch or mark with a pencil through the centre hole. You can make or buy a pair of these yourself, which I have done. As you can see from the photo, these are simple to make. To use, place the leg on the outside of the bowl blank, now open the other leg until it's near the centre, then draw a line. Next, move round the blank drawing lines in the centre until you can see the middle of the bowl blank.